PHUKET: After help was provided by the Department of Disaster Prevention and Mitigation (DDPM) the floods that had affected several parts of Phuket started to subside. 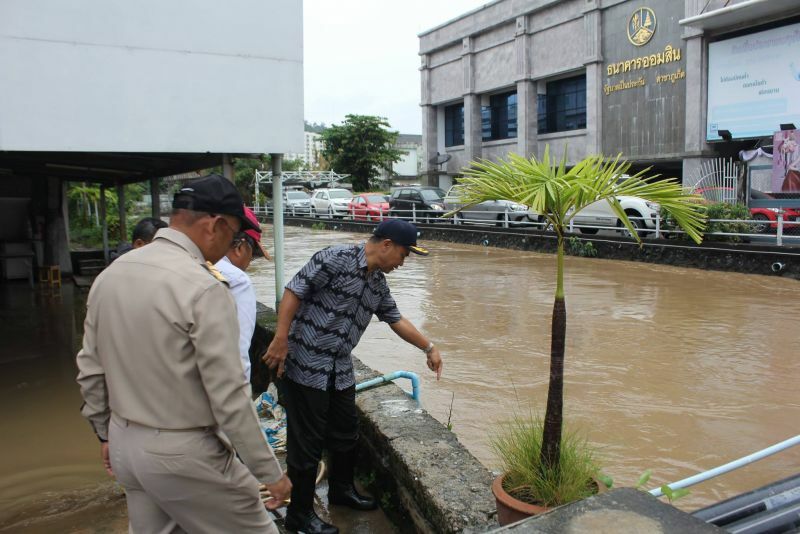 However, Phuket Governor Norraphat Plodthong has now ordered that Bang Yai Canal in Phuket Town be reconstructed to allow a higher volume of water to flow. After continuous rainfall in Phuket over several days (Aug 26-28), Gov Norraphat along with Mr Thawee Homhuan of the Phuket Provincial Offices of Public Works and Town & Country Planning, Phuket Municipality Permanent Secretary Mr Thawatchai Thongmung and related officials yesterday (Aug 28) visited flooded areas in Phuket Town and ordered the widening of Bang Yai Canal as water levels in the canal breached the banks and caused floods. 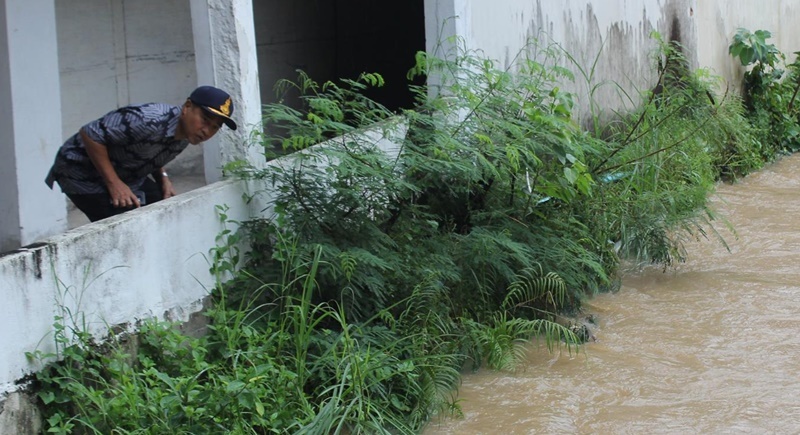 Flood waters from the canal spread to the Chartered Bank Intersection on Phang Nga and Thepkrasattri roads, while municipality staff collected rubbish from the canal to improve drainage. “The cause of this overflowing is due to a high volume of water flowing from Kathu. The Bang Yai Canal is somewhat narrow, especially at the bridge. 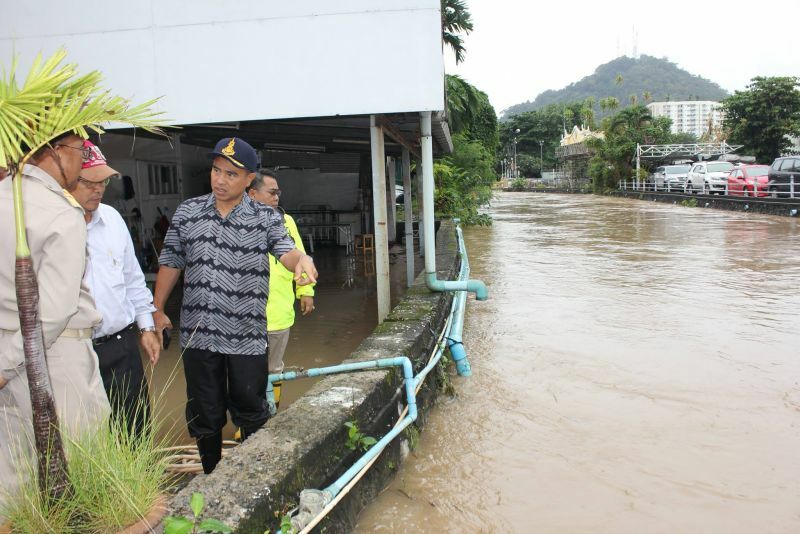 With a width of only four-five metres it cannot handle the flow of water quickly enough,” said Gov Norraphat. “The Phuket Provincial Office of Public Works and Town & Country Planning has set a budget to widen the canal to at least eight metres to accommodate the amount of water and prevent overflow in future,” Gov Norraphat added. However, as some land around the canal is privately owned, Gov Norraphat said that he has ordered Phuket Municipality and the Phuket Provincial Office of Public Works and Town & Country Planning to negotiate with the landowners urgently today (Aug 29) to carry out the reconstruction as soon as possible. “Draining pumps will be on standby in some areas such as Patong for now, in case of any imminent heavy rainfall,” said the official who declined to be named.